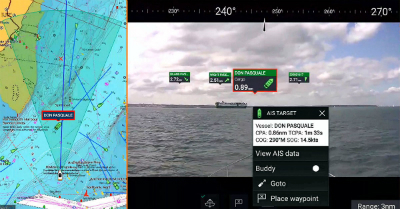 FLIR Systems delivers a marine industry first with the introduction of the Raymarine® navigation technology, ClearCruise AR (Augmented Reality), which brings enhanced on water awareness to Raymarines family of Axiom® multifunction displays (MFDs). With ClearCruise AR, Raymarine Axiom users can make smarter decisions with physical navigation objects overlaid directly on Axioms high-definition (HD) video display. FLIR also announced a new video stabilization module, the Raymarine AR200, which integrates with ClearCruise. ClearCruise AR video imagery is supported by Raymarine CAM210 HD marine cameras to provide an augmented reality view from any camera position on the vessel. The AR200 video stabilization module includes a precision GPS/GNSS sensor and the same attitude heading reference sensor (AHRS) technology used in Raymarines award-winning Evolution autopilots. ClearCruise AR accurately displays nearby navigation markers, automatic identification system (AIS) traffic, objects, and waypoints in sync with real-world imagery for instant recognition and making complex navigation and high traffic situations simpler to understand.